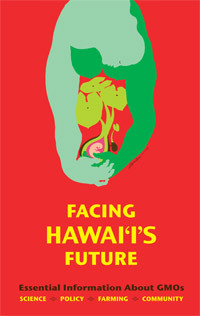 Hawai‘i SEED is publishing a second edition of its book “Facing Hawai‘i’s Future: Essential Information About GMOs” in January, 2012. This collection of essays by celebrated authors, researchers, lawyers, farmers and community activists covers “the big picture” of genetically engineered agriculture in Hawai‘i and raises important questions about the future of this industry in our Islands. The Hawaiian Islands stand isolated and unique, alone in a vast sea. The complex ecosystems that form life here evolved slowly over eons of geologic time. Hawai‘i is a “hotspot” of biodiversity with more species of endangered plants and animals than anywhere else on Earth. This priceless living treasure, however, is under siege. Development, increasing population and climate change all put pressure on Hawai‘i’s ecosystems. Alien species, with increasing frequency, overtake our natives, erasing our opportunity to understand the intricate web of life which surrounds us and of which we are part. Today, we can see an approaching food and farming tsunami. The revolution occurring in agriculture has the potential to forever change the basic genetic structure of the food we eat, as well as the soils, the plants, and the animals that form the delicate balance of our pristine ecosystem. Multinational corporations and universities with the full support of federal and state governments are altering the genetic structure and nutritional content of the foods we eat, patenting the seed, preventing farmers from saving seed, and changing the course of 10,000 years of agriculture. Genes of different species are being combined in food crops at the molecular level without knowledge of their effects on ecosystems or human health. Years ago, a decision was made to allow Hawai‘i to become the nursery for experimental genetically engineered agricultural crops known as GMOs (genetically modified organisms). Big corporations have big influence and our year-round growing season, geographical isolation and permissive regulations each contributed their part. Unfortunately, co-existence of conventional (non-GMO), organic and GMO agriculture is not biologically possible. There is so much to preserve and protect in our islands, yet GMOs will never give us the truly diversified food production and food security we need. Many people have a different vision of Hawai‘i’s path to an ecological and sustainable agricultural future. This vision is grounded in recycling the vast bounty of organic materials available in the tropics to produce soil and ecosystem health; in wise choices of planting varieties and growing season; and in a better understanding of the complex interaction between ‘āina and culture. Imagine a proud and independent Hawai‘i filled with unique varieties of locally produced tropical foods grown on diverse family farms. Imagine our islands as a mecca not just for recreation but also for health and wellness, an example to the world. Imagine our state and county agencies and our university system supporting these ideas. Hawai‘i SEED is a grassroots coalition of farmers, consumers, parents, doctors and scientists from every corner of the Hawaiian islands. Now is the time to bring increased awareness and speak openly about GMO agriculture and its effects on the environment, health and culture of Hawai‘i’s people. We hope to grow a vision for a more sustainable form of agriculture based on statewide support for local, diversified farms and aware, engaged communities. It is not too late for Hawai‘i to bring that vision to life. As you read the stories in this compilation, some frightening and others inspiring, we ask you to keep this vision in mind. This book is meant to be used as a tool for change, an opportunity to build the future that our children and their children deserve. Pale ke ao – protect what is here now.